Vinca is toxic. Every part of the plant--roots, stems, leaves and blossoms--causes symptoms if it is ingested. Vinca is harmful to dogs, cats, horses and humans. If any part of the plant is ingested, vinca poisoning causes abdominal cramps, vomiting, diarrhea, a drop in blood pressure, lethargy and/or tremors or seizures. Larger doses induce coma or even death. Plant vinca vine in either sunlight or shade. Although vinca will grow in poor soil, it's important that the soil drains well. If necessary, work an inch of manure or compost into the top 6 inches of soil. To plant vinca in a container, use a pot with a drainage hole and plant the vinca in commercial potting soil. Spread 1 to 2 inches of mulch around the vinca plants. Mulch such as shredded bark will retain moisture and will prevent rain from splashing on the leaves. Fertilize vinca vines every month during spring and summer, using a general-purpose water-soluble or granular fertilizer. Always adhere to the manufacturer's recommendations when applying fertilizer. Keep the soil moist for a few weeks or until new vinca vines are established, which is indicated by new growth. After that time, vinca vines will need to be irrigated only during extremely hot, dry weather. Containerized vinca vines should be checked daily during hot weather, as soil in containers dries out quickly. Cut back any unhealthy growth you find growing among the vinca minor vines in late winter or early spring. Remove the vines that appear dead, dying or diseased by cutting them off where they intersect with other branches. Prune the vinca minor to control the growth of the plant. This may be especially important for vinca minor you are growing as a ground cover. If the vinca minor grows past the boundaries you desire, trim it back so it is within the boundaries again. Perform a hard prune of the vinca minor every three to four years. Use the pruning shears to cut back every vine to approximately 6 inches above the soil level. 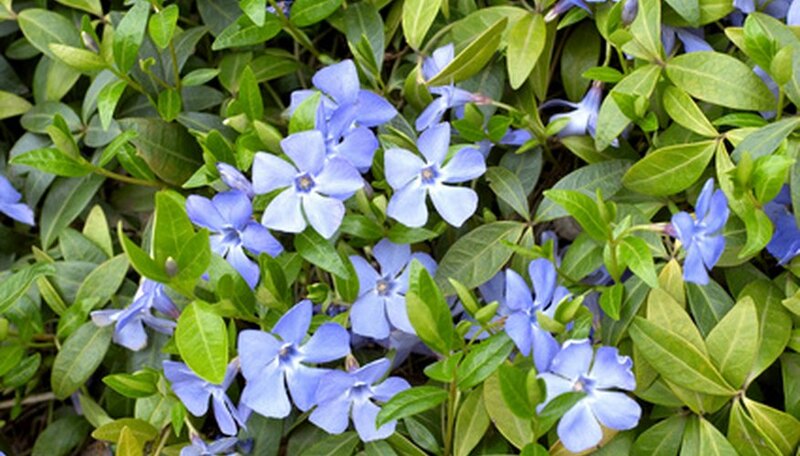 The vinca will respond to this hard prune by growing back with renewed energy and vigor. It will also look especially attractive as it fills in the growing area again during the growing season. Dig out the Vinca minor. The plants create relatively shallow root networks, making manual removal feasible in most situations. Locate the center of the plant and use a spade to loosen the soil. Grab the plant at its base and pull it upward to uproot it. Mow down the Vinca minor as an alternative to digging out each plant. This is ideal for larger patches of the ground cover. Repeatedly mowing the plant to the ground with either a lawn mower or weed eater will eventually starve the plant and kill it. Spray the Vinca minor with a glyphosate-based herbicide, available from nurseries and garden stores. This is best for very expansive patches of the ground cover, as well as for homeowners who don't want to spend time digging or mowing. Mist an even coat of glyphosate on all of the plants' exposed surfaces. The Vinca minor will die within 10 to 14 days. Mow your vinca with a rotary mower set at its highest setting (around 4 inches). This is the easiest and fastest way to prune vinca. For a small space, you can use a weed whacker instead. Hand-cut vinca with pruning shears as an alternative. According to Texas A&M University, cutting back the vinca’s height to just 4 to 6 inches every three years will help keep it manicured and neat, while still maintaining a vigorous and nice groundcover. Cut away dead and damaged limbs with hand clippers any time of the year. Rake the clippings and discard. Add them to the compost bin or to take them to your local yard-waste facility if possible (unless they’re diseased). Your vinca flowers may be wilting because of lack of water or the diseases Phytophthora blight or girdling cankers. These diseases will cause the whole plant to wilt. Few diseases bother Vinca major with the exception of the fungi Phoma sp. and Phomopsis sp. These funguses cause the plant to wilt and turn black or brown, dying back to the soil. Affected stems may develop black, raised growths. Proper watering practices prevent most outbreaks of vinca major disease. The plant is drought tolerant and rarely needs to be watered, except in very dry conditions. Soaker hose irrigation and early morning waterings allow leaves to dry quickly, avoiding the spread of disease. Removal of all diseased plants will minimize the spread of the disease. Additionally, copper and mancozeb fungicides are sprayed on diseased plants monthly to destroy the fungus. Compact nursery plants with healthy looking stems and green leaves are better able to resist disease. Yellowed leaves indicate the plant may already be infected. These plants should be avoided. Vinca major thrive in moist, humusy soil in partial to-full shade. They are evergreen and hardy to USDA plant hardiness zones 6 through 9. Vinca major may become invasive and should be thinned to improve plant health. Plant after the last frost in spring or a month or two before the first expected frost in fall. Look for healthy green plants that have few to no flowers in the garden center. Dig down and turn over the soil at a 6 inch depth incorporating 1-inch compost in the ground. This may not be possible under trees because roots grow in the top 12 inches of the soil. Use a shovel and carefully dig down about 2 to 3 inches where possible. Dig a hole that is two times as wide as the root ball and the same depth it is in the pot. Set the plant in the hole, then fill around with soil and firm it into the ground. Arrange plants in rows, spacing the plants about 12 inches apart. Start the next row 12 inches behind. Place each plant in between the plants in the first row making a diamond configuration with all plants being 12 inches apart. Plants should be staggered and instead of making straight, uniform lines so they fill in the area properly. Water plants so soil is evenly moist for a few weeks until they become established. Mulch new plants to keep roots moist. Eventually the plants will grow dense and mulch will not be necessary. Pull weeds regularly so they are not in competition with periwinkle for nutrients in the soil. Dig up a clump of periwinkle and plant it in areas where none grow after a month or so of growth. This allows for complete coverage without having to purchase more plants. Fertilize in the spring with 10-10-10 fertilizer at 6 pounds to 1,000 square feet. Plant vinca in full sunlight or in partial shade. Vinca will do best with at least four to six hours of sunlight per day. Keep the soil lightly moist until the roots are established and new growth appears. After that time, vinca needs water only during the hot, dry weather. Spread 1 to 2 inches of mulch around the plants. Mulch, such as shredded bark, will keep the roots cool and deter weeds. Water once every month during spring and summer, using a general purpose granular or liquid fertilizer. Apply the fertilizer according to the manufacturer's directions. In the cooler climate of North America, vinca acts like an annual and blooms from late spring until the first frost. In the southern United States, it acts like a perennial and does not die back in the winter. Vinca plants are drought tolerant and require very little maintenance. The flowers do not need to be pinched back as they fade, since they drop off by themselves. Vince plants do not like cool temperatures or an abundance of moisture. Most types of vinca plants grow to 1 to 1 1/2 feet tall. There are some dwarf and compact varieties. Vinca plants are susceptible to fungal diseases if overwatered. These include root rot, botrytis, Alternaria leaf spot and aerial Phytophthora. They are occasionally infested with aphids. Rabbits and deer avoid eating vinca plants. Purchase vinca minor seedlings at a nursery or garden supply center. Although most vinca minor will have lavender blooms, it's also available in shades of white, burgundy and purple. You can also purchase dwarf varieties that will be somewhat less invasive. Choose a place for the vinca minor. It's sturdy enough to grow anywhere, but keep in mind that it can be an invasive ground cover, so you may want to plant it a good distance away from other plants and give it plenty of room to spread. Plant the seedlings at least 18 inches apart. Water the vinca minor often until the plants are established, and then they'll be ready to survive on their own with very little help from you. Water only during periods of drought, and allow the soil to completely dry prior to watering again. If growing the vinca minor in containers, you will need to check the soil more frequently, as those in pots tend to dry out quicker than when grown in the ground. Keep water off the foliage as much as possible. Fertilize the vinca minor once a month during the growing season with a granular 10-10-10 formula, at the rate suggested on the fertilizer label. Add a 1- to 2-inch layer of mulch around vinca minor plants. Cut back the vinca minor to 1/3 its size in the spring. Mix the fertilizer with water in the watering can according to package recommendations for the size of the container or planting area where the vinca grows. Pour the fertilizer carefully around the soil where the vinca grows, taking care not to splash fertilizer onto the plant foliage and blossoms. Saturate the soil completely with fertilizer. Water the vinca immediately after you fertilize to help the fertilizer absorb into the soil. Rinse any fertilizer off the plant foliage if fertilizer inadvertently splashed during the application process. Repeat the fertilization process once each month to keep vinca growing and thriving in a garden space or container. This woody stemmed vine has evergreen leaves and usually features violet blue funnel-shaped flowers, though some have white flowers or other color varieties. It makes a good ground cover, as it roots along the surface of the ground. Creeping myrtle needs shade or full sun, producing more blooms in full sun than in shady environments. It needs moist soil. Vinca minor is the most hardy of all periwinkles and is able to survive in USDA hardiness zones of 4 to 9. In zones 8 and 9, it will need shade due to the air temperatures. The vinca minor can cause stomach issues if ingested. Keep away from pets, livestock and small children. Common periwinkle contains an alkaloid named vincamine, the source of the drug vinpocetine. Both vincamine and vinpocetine are prescribed in Europe to treat memory and cerebrovascular problems. Remove any dead or dried leaves from your Vinca plant by a process of hand-pulling. This is necessary as it helps prevent the spread of decay throughout the plant leaves. Dispose of the dead, rotting leaves into a trash bag or compost bin. Fill a spray bottle with a solution of 1/2 cup water and 1/2 cup insecticide (available at any home and garden center). Gently spray the Vinca plant with the solution to prevent insects from eating your Vinca leaves, causing further decay. Leave solution to dry; do not rinse off. Reapply solution twice in the summer, once in the fall and spring. Application is not necessary during the winter season. 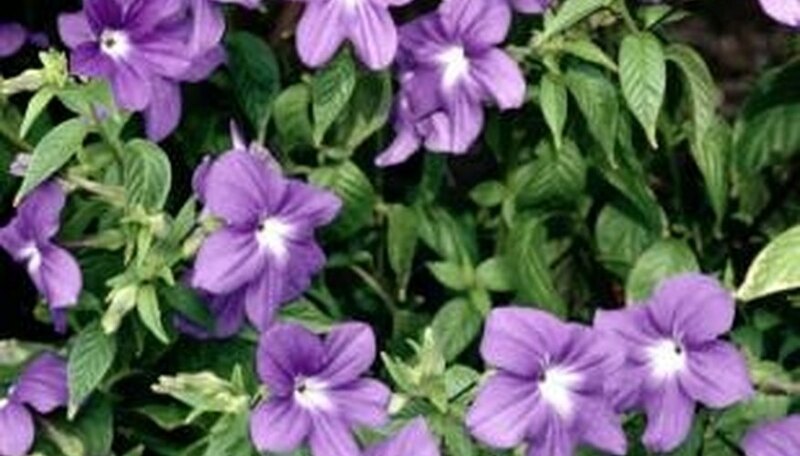 Use a hedge trimmer, mower or weed trimmer to cut the vinca as short as possible. Dig up the area where the vinca is growing. Vinca has long, tenacious roots and runners, so dig up an area at least 36 inches wider than the plant's location. Pull out all the vinca pieces and place into the trash. Do not compost any part of it. Spray an herbicide containing glyphosate (such as Roundup) on any vinca that reappears. You may need to use multiple applications, and the best time to apply is in the warm months when vinca is actively growing. Use care when applying, because glyphosate will kill any broadleaf plants and grasses that it touches, according to the University of Minnesota Extension. Wait two to three weeks for the herbicide to kill the remaining vinca, then dig up and dispose of all the pieces. Choose a gardening site. Vinca major can tolerate both full sun and partial shade, but the University of Arizona warns that it can't handle hot afternoon sun. Ideally, select a site on shady sides of your home or beneath trees that provide dappled shade. Amend the soil, as Vinca major thrive best in organically enriched dirt, according to North Carolina State University. Use a spade or a mechanical tiller to breakup the dirt into fine clumps to a depth of 6 to 8 inches. Stir in 3 to 4 inches of compost or aged manure. Follow with an application of an all-purpose fertilizer, such as a 10-10-10 product, applying it according to its labeled instructions. Plant the Vinca major. Use either transplants from a nursery or rooted branches divided from an existing Vinca major plant. Bury the transplant or rooted branch up to its crown, which is the point where the stem meets the roots. Water the planting site thoroughly to moisten the dirt to a depth of 6 inches. Repeat once a day until the Vinca major plants are established and begin producing new leaves. Once established, the University of Arizona recommends irrigating once or twice a week.